One of my favorite new furniture lines is MASH Studios’ LAX series designed by Bernard Brucha who has done work for Martha Stewart, Siemens, Ogilvy & Mather, Toyota, and MTV. The designs are clean, mid-century inspired, and all are built with beautiful walnut and aluminum. Made from multiple planks of solid wood, these pieces are an alternative to traditional wooden case goods with a plane of continuous veneer. 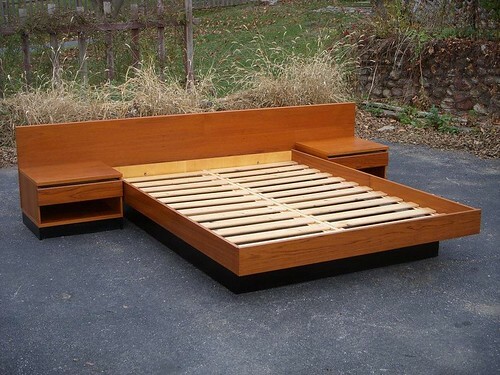 Above: LAX Platform Bed — Available in queen or king sizes with wall-mounted, sliding door headboard. That sliding door storage is also available as a floor cabinet. I bought two of these so I can vouch for the quality. Very solid workmanship. The wood (English walnut) was lighter than I expected, but two coats of Danish Oil in Medium Walnut did the trick. 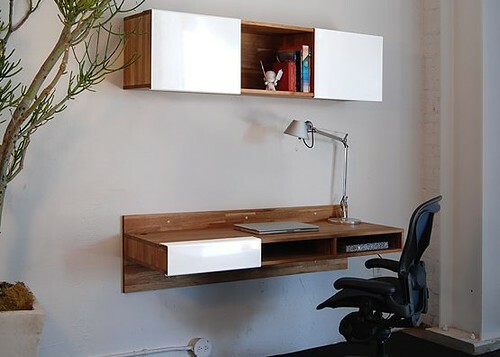 And the concept is repeated again in a clean, space-saving mounted desk. 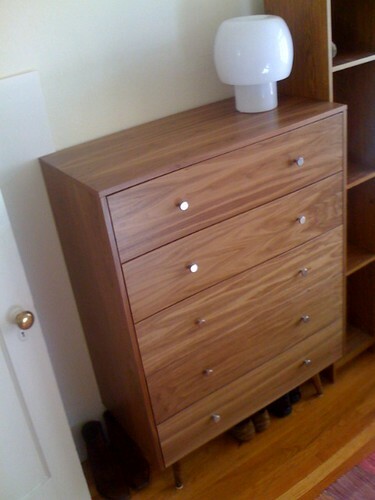 Finally, the no-nonsense, solid walnut, visible-hardware-free LAX Bookcase. If you’re interested in any of these pieces, buy from the links above and you’ll support the Mid-Century Modernist with a little kick-back. Thanks for the heads-up!! Fabulous pieces — especially the mounted desk.